I saw in the forum someone asked about a Kosovo terrain and someone else thought there was one around (albiet this was posted some time back.) Anyway, here is that Kosovo terrain. Unfortunately, somehow ( i ) apparently overwrote the planning maps with the 'desert' planning maps at some point so i put in blank bitmaps to substitute. If you take one of your msn files and substitute 'kosovo' for lets say 'desert' it should work. If you use the kmd mission editor you can see where the targets are located and move your planes where you want of course. Perhaps, I will get some sort of map plotted at some point, but the only way i know how to do that is to trial and error with the kmd mission editor and starting the game up to see where i end up. Someone with more experience with some other util could prob whip something up. 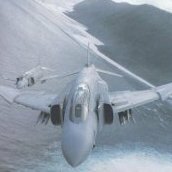 If, you like the F-4S in the image I will try to get the skins finished and up load it soon. I do not know who created this Kosovo terrain to give credit to or if they mind me loading it here. Have no clue where and when i got it. Must have been years ago. Its pretty simple terrain. Very frame rate friendly, tons of mountains and hills, plus the ocean (the adriatic i suppose its called.) Not up; to modern standards. You might like the 'Black Sea' terrain better if you want detail and fly in that neighborhood. It was never completed then, and is just as incomplete now.